This 2-hour session gives you a platform to step out of your business, think strategically about your marketing, and get expert feedback and advice on your ideas and plans. What marketing are you doing and is it working? I can help you overcome the overwhelm of not knowing how best to spend your limited time and budget. This session is yours to use as usefully as you see fit. You might have a particular idea, plan, campaign or material (like a brochure, website, email or advert) in mind that you want to talk through and check. You might want to spend some time working out how to communicate your business's value to your customers. ​Or, you might be looking for general advice and help creating a realistic and achievable marketing plan. What do I want to achieve with my marketing? Who is my ideal customer and do I understand them well enough to market to them? What do I need to say to my customers to make them sit up and take notice? Which marketing activities should I prioritise and which activities should I park (or ditch completely)? How will I know if my marketing is working? Understanding of your priorities so you know which marketing activities to focus on right now. Clarity on a particular challenge or question that has been eluding you. Confidence that an independent expert concurs with your proposed course of action. Motivation and enthusiasm to move forward now that you have become "un-stuck". One 2-hour one-to-one session in Portishead or at a mutually convenient location. These sessions can be done virtually if necessary. Please call me to discuss this option. A 15-minute follow-up call after the session to keep you accountable in implementing the actions from the session. There is no agenda for the session because we'll use the time according to the challenges and questions you're facing in your business. Before the session, I'll send you a questionnaire to help me understand your business better and make sure you get the most from the session. I offer a free “taster” call where we can talk through any marketing challenge you’re facing and see if we’re a good match. I don't want to waste your time and money if I can't help you, so I insist on having a call with every client before they book a Sounding Board session. If needed, after the session I can write up the actions arising from the session in a one-page Marketing Action Board. I'll also document the notes I've made and include any useful resources that will help you implement your actions. This service costs an extra £250. Not ready for a sounding board? Read my blog for lots of bite-sized marketing advice. Contact me to discuss other options. 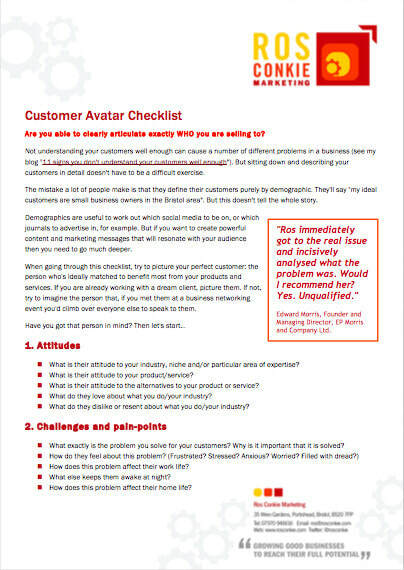 Free Guide: "Customer persona checklist"
I often find businesses think they know who their ideal buyer is, but when we start to drill down and talk about out exactly the kind of people we want to target, we discover that there are a lot of unanswered questions. So I've written this checklist explaining exactly how to create an effective Customer Persona. I'm giving it away free as a thank you to anyone who signs up to receive my monthly newsletters.